The CliniMACS® CD34 Reagent System was tested in a phase II single-arm multicenter study with a total of 37 patients in first morphologic complete remission. The multicenter, phase II clinical study was conducted in collaboration with the Blood and Marrow Transplant Clinical Trials Network (BMT CTN). This registration trial BMT CTN 0303 was designed to provide extensive T cell depletion using the CliniMACS CD34 Reagent System, to eliminate the requirement for post-transplantation pharmacological GVHD prophylaxis in adult patients with AML in first complete remission undergoing a myeloablative transplant from a matched-related donor. The goal was to demonstrate that the side effects of T cell–depleted hematopoietic progenitor cells collected by apheresis (HPC, Apheresis) would be reduced if combined with a conditioning regimen that was highly immunosuppressive and anti-leukemic. The clinical trial included 37 subjects in first complete remission (CR) undergoing transplantation at eight different centers in the BMT CTN. The conditioning regimen consisted of hyperfractionated total body irradiation (1375 cGy in 11 fractions) with partial lung shielding, thiotepa (10 mg/kg), cyclophosphamide (120 mg/kg), and rabbit antithymocyte globulin (2.5 mg/kg). No pharmacological GVHD prophylaxis was given post transplantation. The donors, all HLA-identical siblings, were given G-CSF for mobilization and scheduled to undergo at least two apheresis procedures (but not more than 3) to ensure a graft with a high CD34+ cell content. All allografts were enriched for CD34 and were targeted to contain > 5.0×106 CD34+ cells/kg and < 1.0×105 CD3-positive cells/kg. T cell–depleted allograft was > 75%. All patients engrafted neutrophils (>0.5x109 per liter) by day 21 after transplantation. The platelet count recovered to >20x109 per liter by day 100 post-transplantation for 92% (95% CI, 82.4 to 100%). There was one late graft failure. The incidence of both acute and chronic GVHD was low. 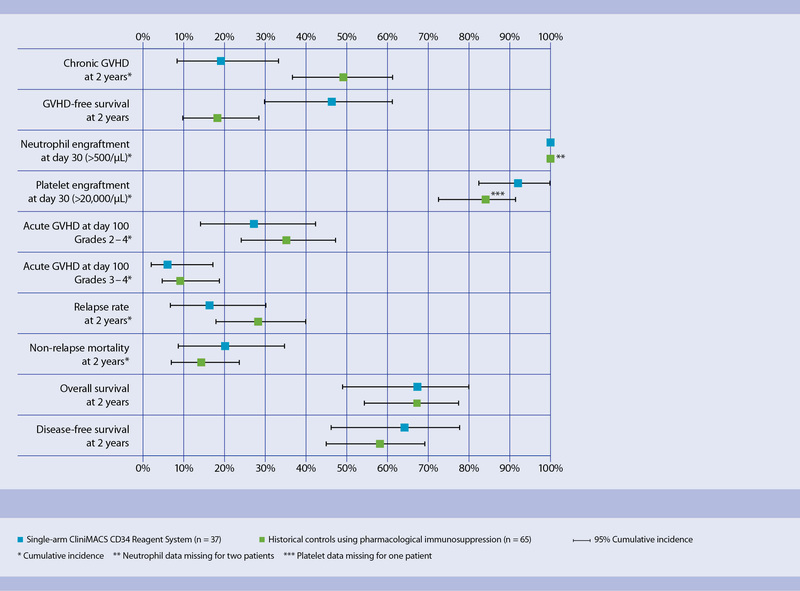 The cumulative incidence of acute GVHD grades II–IV was 27% at 100 days follow-up, while grades III–IV were only 5%. Chronic GVHD was 19.0% at 2 years follow up. The cumulative incidence of relapse at 2 years was low with 16%. DFS was 64% at 2 years. GVHD-free survival at 2 years was high with 46%. The primary endpoint of the trial was met. DFS probability at 6 months post transplantation was 81.8% for all transplanted patients. None of the sites reported any unexpected grades III-IV adverse events. Adverse events in this study were due to regimen-related events and toxicities common to allogeneic hematopoietic stem cell transplantation and could not be attributed to the CliniMACS CD34 Reagent System. In general, it can be stated that no observed adverse event can be attributed to the CliniMACS CD34 Reagent System or any of its components. All allografts transplanted in this study were enriched for CD34+ cells using the CliniMACS CD34 Reagent System. Eighty-four selection procedures were performed on HPC, Apheresis collected from a total of 44 donors. The minimum number of CD34+ cells required for transplantation, greater than 2 x 106 per kg recipient body weight, was achieved for 100% (44) of donors. The target number of CD34+ cells, greater than 5x106 per kg recipient body weight, was achieved for 84% (37) of the 44 donors. Device performance is shown in the table below. A two year comparative analysis was carried out by comparing the 37 patients in CR1 of the BMT CTN 0303 study to a cohort of 65 patients in a contemporaneous trial for AML patients (BMT CTN 0101) who had been matched for patient demographics as well as for disease and transplantation characteristics. T cells had not been depleted from the graft in this patient cohort. Instead, they had been given standard pharmacologic immune suppression post transplantation for GVHD prevention. The BMT 0303 study demonstrates that transplantation of T cell–depleted hematopoietic progenitor cells collected by apheresis (HPC, Apheresis) following intensive myeloablative chemoradiotherapy can be safely performed in a multicenter setting using the CliniMACS CD34 Reagent System to deplete T cells as the sole means of GVHD prophylaxis. Due to the highly efficient T cell depletion there was no need for any immunosuppressive post-transplantation prophylaxis. 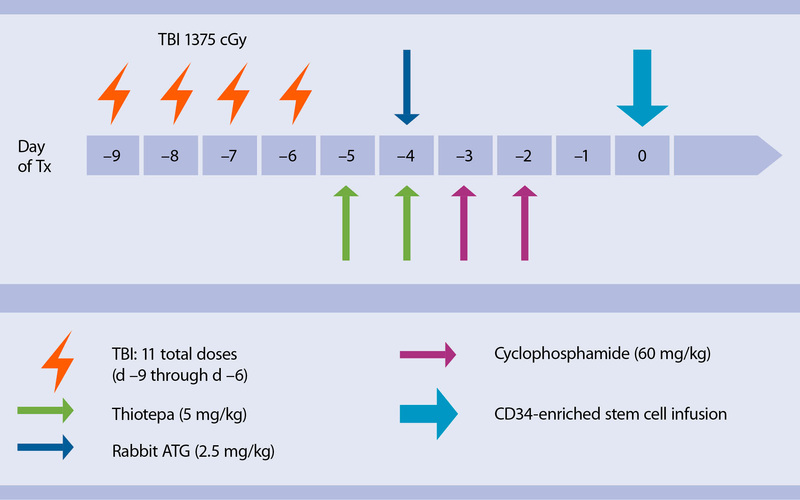 This therapeutic approach results in a low incidence of acute and chronic GVHD; particularly the 19% incidence of chronic GVHD at two years follow-up was strikingly low compared to rates seen with conventional GVHD prophylaxis. When compared to a patient cohort matched for patient demographics as well as for disease and transplantation characteristics who had received an unmanipulated graft, the risk of relapse was not increased. Authorized by U.S. Federal Law for use in the treatment of patients with acute myeloid leukemia (AML) in first complete remission. The effectiveness of the device for this use has not been demonstrated. The CliniMACS® CD34 Reagent System is indicated for processing hematopoietic progenitor cells collected by apheresis (HPC, Apheresis) from an allogeneic, HLA-identical, sibling donor to obtain a CD34+ cell-enriched population for hematopoietic reconstitution following a myeloablative preparative regimen without the need for additional graft versus host disease (GVHD) prophylaxis in patients with acute myeloid leukemia (AML) in first morphologic complete remission. Do not use CD34+ cells prepared with CliniMACS CD34 Reagent System in patients with known hypersensitivity to murine (mouse) proteins or iron dextran.